Just to make sure, I went and downloaded the trial version of Windows Server 2008 from the Microsoft website. I installed it on this 8-core Opteron workstation with 8 GB of RAM that AMD sent me awhile ago for doing multithreading and performance scaling stuff. I installed version 3.22, then updated it to 3.30 Beta 2 to make sure that would work, and sure enough it does! I’m not surprised, but I felt the need to verify this anyway 🙂 I’ll make sure the website lists Windows Server 2008 as a supported OS on the next update. As an interesting side note, having access to systems with 4 and 8 cores has brought up an interesting performance problem in Paint.NET, and key insights for optimization and design going forward. In the past I have done a lot of work to ensure that certain key rendering code is multithreaded, and as such going from dual- to quad- to octa-core has yielded healthy performance gains. Even on these systems, quite often, I just can’t get CPU usage all the way up to 100%! 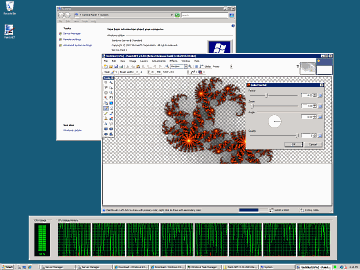 Just look at the screenshot above: even on a very compute-intensive effect such as Julia Fractal, at highest quality, on a 16,000 x 9,000 pixel canvas (yes that’s 144 megapixels), the CPU usage is bouncing around and clearly not anywhere close to full performance. I guess the silver lining here is that power consumption is a little lower as a result, eh? Even on my personal quad core desktop, I’m lucky if rendering a large gradient can hit 65% CPU usage. There’s a lot of wasted performance by having the rendering pipeline set up the way it us. Hopefully my talks with the .NET Parallels Extensions team will help me to improve this situation, while also putting some extra “real world” code in their laps to play with. With the current design, I wouldn’t be surprised if Paint.NET could barely keep a 64-core system more than 15% busy. More on what that actually means later. I’ve got a lot of thoughts on parallel/asynchronous, concurrent, and functional programming and how it relates to multithreading, correctness, and performance. Hopefully I can put some of that into writing! ** That would be 1) Paint.NET, and 2) the other one that I work on at Microsoft (“my day job”). This is a cool article. As well, it leads me to a question: are there any other public applications you have built or any information you can share about the applications you build at the Big M? As well could this mean you could possibly take Paint.NET online using Volta? I know it isnt obviously for large share, but you could run Paint.NET for your own personal gain? Geah! This article leads me to so many questions. Mike — I try to keep my “day job” project separate from Paint.NET, as I feel that there is no need to establish any publicized link between them. I mean to say that as a developer actually having Paint.NET running online could be a personal gain for you. As well, the idea of an “export to photobucket” really is a great idea. I had similar ideas about two weeks ago but I am no developer yet. In my experience, the Parallel Extensions work really well – on my quad core.